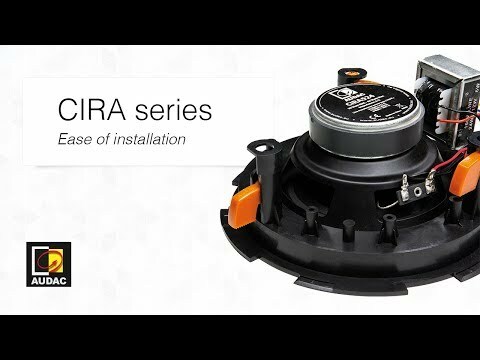 The CIRA7 features a 6.5” driver using polypropylene cone material, combined with a 1” Mylar tweeter fitted with a phase plug for excellent off axis performance. The selected materials guarantee a low distortion performance with smooth and flat frequency response. A continuous power handling of 30 Watt (RMS) and maximum power handling of 60 watt is achieved, while fitted with a multi-tapping 100V line transformer with tappings for 24W, 12W, 6W and an 8 Ohm or 16 Ohm bypass connection.